Society and those who lead it must be informed about the way in which it is protected. Ten years in prison for 70 dollars is a political experience. Recent years have witnessed the consolidation in the historiography of “the 68 years” of a contentious hypothesis – namely that the anti-systemic practices of the French far Left in the wake of les événements served as vanishing mediators for the introduction into French civil society of expansive forms of democracy. Thus, in his survey of French Maoism as a “constructive political learning process,” Richard Wolin declares that “Maoism, in its post-May incarnation, played the unsuspecting role of a way station or transmission belt, weaning intellectuals away from the dogmas of orthodox Marxism and exposing them to an expanded definition of human emancipation.” 1 Mining the same seam, Julian Bourg argues that one “of the great ironies of 1970s France is that some of the principal voices in the revitalization of civil society were speaking in Marxisant-revolutionary tongues.” 2 To the extent that they posit that, in what concerned the substance of their actions, the activists of ’68 knew not what they did, these reconstructive accounts of the cunning of liberal democracy are the optimistic pendant to Régis Debray’s disenchanted account of that tournant in French political life, viewed as the midwife of France’s subsumption to the social patterns of advanced capitalism. The irony of this irony is that in both instances, the demise of a teleological Marxist dogmatism is couched in exquisitely teleological terms, with the misrecognition of the Cultural Revolution serving as the prelude to a cultural revolution away from revolutionary attachments (be they Jacobin or Leninist), and towards associational democracy (in the happy case) or integrated commodity culture (in the bleaker scenario). However tendentious or fallacious the thesis of French Maoism as democratic vanishing mediator may be, it has the virtue of directing our attention to the complex moment of the early 1970s in France – an especially overdetermined and politically saturated conjuncture, traversed by intimations of defeat, forward flights toward “civil war,” rediscoveries of orthodoxy, and multiple varieties of depoliticization. Key to both Bourg and Wolin’s dossiers is the part played in the de-Marxifying trajectory of French Maoism (or rather, of a particular fraction of it, principally represented by the Gauche prolétarienne [GP]) by the formation in early 1971, by ex-militants of the recently proscribed GP and various intellectuals – among whom the most prominent and involved was Michel Foucault – of the Groupe d’information sur les prisons (GIP). 3 We are fortunate to now have in a French edition a collection of the five booklets produced by the GIP between February 1971 and January 1973 – Intolérable, numbers 1 through 4, and a collection of prisoners’ demands – combining questionnaires and inquiries on prison conditions, texts and declarations from prison uprisings, reports by prison psychiatrists, a dossier on the killing of George Jackson and the black prison movement in the US, and correspondence and information about the wave of suicides in French prisons. 4 This small archive is all the richer inasmuch as it repels a reduction of its ambiguities through the flattening logic of the futur antèrieur (“it will have been the case” that these inquiries were a step away from Marxism and towards democracy…). 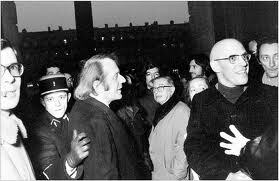 As the declaration and prefatory text to Intolérable 1 manifest, the GIP’s prison inquiries are a sui generis combination of methods and objectives stemming from the experience of French Maoism, the ferment in the penal system, broader shifts on the French Left, mutations in the figure of the intellectual, and the political thought of Michel Foucault. 5 The GIP’s inauguration coincides with the end of a hunger strike of Maoist prisoners – and with their decision no longer to demand the status of “political prisoners,” in contradistinction to ordinary (droit commun) inmates. For all of the editor’s emphasis on the irreducible singularity of which the GIP is supposed to be the bare repeater or relay, the group’s pamphlets begin with a minimal but incontrovertible slogan: “Courts cops hospitals asylums school military service the press the TV the State and first of all the prisons are intolerable.” Refusing the horizon of “reformism,” they declare that allowing prisoners to speak on their own behalf, and using the group to transmit their speech and writing to other prisoners, is “the only means to unify in the same struggle the inside and outside of the prison” (16). It is not a matter of inculcating the “consciousness of oppression,” which could hardly be absent, nor knowledge of who the enemy is, a daily experience; rather, it is a question of countering the manner in which the means of formulating, expressing, and organizing this consciousness are systematically quashed and confiscated. There is irony in how the Maoist principle “no investigation, no right to speak” comes to inform these inquiries. For whereas the Maoists first tried to “establish” themselves in the factories to organize the struggle, they were thrown into jails against their will. And their first instinct was separation. Unity here is thus a matter of breaking a division that – as Foucault notes in a number of contemporaneous interviews – was both imposed upon and eventually affirmed by the workers’ movement, with its debilitating introjection of a bourgeois morality itself reproduced by legal and penal institutions: the division between the proletariat and the “non-proletarianized plebs.” 6 The context of the rallying of the GP to the GIP, and of Foucault’s thinking at the time, is thus that of an attempt to overcome the segmentations among the oppressed, primarily between proletarians (or plebs) with a relationship to the factory and ones without. To the extent that the penal system is aimed at producing the isolation of a (criminalized) fraction of the working class, Foucault presents the primary objective of the GIP as the “reintegration” of this fraction into political struggles. 7 Moreover, this attempt to suture the fracture in the proletariat – reproduced both by the repressive apparatus and by the official institutions of the workers’ movement – is doubled by a different kind of alliance-building, in which what has become “intolerable” to “new social strata (intellectual, technicians, doctors, journalists, etc. )” (17) about the ruling order is connected to what has always been intolerable in the experience of the exploited class. “Intolerance” is thus framed not (just) as a humanist cry, but as a project for unifying struggles against capitalism – not by providing them with a “thinking head” but by allowing them to communicate with one another beyond their enforced isolation. These “intolerance-inquiries” (enquêtes-intolerance) have four principles: not to attenuate oppressive power but to attack it in a political act; to be the “first episode of a struggle” by targeting specific institutions and individuals, naming names; to unite around these targets different strata kept separate by the ruling class, thus constituting a single “front of attack”; to be inquiries from the inside, in which the customary objects of investigation become the investigators, speaking on their own behalf and “taking charge of the struggle that will stop oppression from exercising itself” (18). It is fitting that the Intolérable inquiries approached this task by beginning in illegality: prisoners were not allowed to participate in the initial questionnaire so these had to be covertly distributed, by various contacts, especially family members (“some families have become investigators,” the pamphlet notes), in the punitively surveilled context of the “prison visit” (one of the key objects of the inquiries). The approach of Intolérable 1 is methodical. The booklet includes two full questionnaires, two long accounts of prison conditions by prisoners in different establishments, and an anthology of representative statements, thematically classified, from the remainder of the questionnaires. Contrary to Artières’s suggestion in his postface that the GIP had no slogan but that of letting the prisoners speak for themselves (itself a declaration that could be easily problematized: “letting speak” is a very complex act), the first booklet does present itself as connected to a campaign – against the criminal record, posited as a key site for fighting the state’s unlimited power, the hypocrisy of its claims to reeducation, and the endemic violation of labour rights, which turns every release into a mere reprieve. The questionnaires cover, in detail at once harrowing and repetitious, the conditions of prison life in France in 1971 – from the unavailability of dentistry to the brutality of solitary confinement (le mitard), from the lack of books to the filthiness of living quarters, and from the hyper-exploitation of prison labour to the repression of sexual life. 11 Filled out clandestinely, as noted in at least one questionnaire, they are succinct, if detailed, and bleak – like many workers’ inquiries neither enjoyable nor entertaining, and, given the passing of time, also disconnected as reports from the historical immediacy that originally lent them their moral and political force. While Engels’s Manchester still makes for vivid reading, these archives, disjoined from the practice of the GIP, necessarily test the reader – at least for Intolérable 1, it is the monotony of oppression and not the singularity of the voices that stands out. The first questionnaire may give us a clue to this, when, asked “Can you describe the conditions of the prison visit (what seems most intolerable to you)?,” the inmate answers: “No. You cannot describe the conditions of the visit, you have to live them” (though he proceeds to list the noise, the dirt and the anxiety generated by the limit on time) (20). What is perhaps most revealing, though, is his answer to the last question, which asks for general views about the questionnaire and the inquiry. Starkly, he states “you have the wrong address” – meaning that the prison is not a site that could be reformed on its own without taking on the whole of the justice system, where the police engages in forms of violence even more brutal than the ones meted out by prison guards. Though he welcomes the inquiry, as part of a broader investigation into the barbarities of the justice system, its danger is that “the effect is taken for the cause” (31). This recalls an important point made by Foucault in his preface to Livrozet’s De la prison à la revolte, where he notes that though prison writings, namely in the form of memoirs, have been tolerated – as long as they were “as extreme and singular as possible,” adventure writings that served as the converse of the forensic thrills of detective fictions – what has always been proscribed has been the production in the first person of theory from prison, especially in the guise of “a thinking of infraction … a certain reflection on law linked to the refusal of law.” 12 Such theorizing must be left in the hands of the social scientists, for whom the prisoner is the investigated, never the investigator, and prisoners can only form a dispersed collection, never a collective movement. Against the idea that “saying the event” requires celebrating irreducible singularity, the GIP’s inquiries can in part also be seen as a move against the temptation, present in the public genre of the prison memoir, to “conjure away everything that is quotidian, familiar, extremely probable, and in the final analysis that is central in our relationship to the police and to justice.” 13 With their detailed enumeration of unwashed toilets, noise, humidity, mediocre slop, cramped “exercise yards,” frustrated sexuality, or the grinding labour of assembling chairs for a local factory owner, the questionnaires are a taxing testament to this everydayness of oppression, as endemic in its generality as it is arbitrary in its individual manifestations (random censorship, whimsical punishments, bizarre regulations). 14 Indescribable suffering channeled into deadpan descriptions: “8 meters square lit by an armoured window; a basin, a toilet, two mattresses, an interphone. Total isolation. The need for contact turns into delirium. I bang my head against the wall to break the monotony” (57; also 120, 136 and passim). As Intolérable 2 shows, this mode of inquiry – methodical and anonymous, with the inquirer hidden behind the apparent banality of the questionnaire – is not the only one employed by the GIP. The second pamphlet, an investigation of the “model prison” at Fleury-Mérogis starts on a rather lyrical vein, with a dramatic account of a prison riot under the title “It was May First, and the weather was beautiful” and has no compunction in interpreting the actions of prisoners in revolt. Discussing a protest in the exercise yard, the unsigned prisoner, who seems from the language employed to be one of the GP inmates, or at least a sympathizer, says “it was more a manner of showing a little freedom than to refuse an order. … They didn’t want anything, they wanted to stay there.” We can see in this interpreting of an act as uninterpretable, or representing an act as unrepresentable, what still remains a mainstay of contemporary radical theorizing – though here accompanied by a late Leninist reflex. Though the prison revolt is rightly beyond demands – a movement of “desperados” exercising “our right to freedom even within the prison” – it is also marred by its “spontaneity” (90-1). Beginning with this chronicle and analysis of a riot, the GIP’s second pamphlet is much more mixed in forms of writing. The second text originates in the Fleury-Mérogis guards’ branch of the Force Ouvrière union, more specifically in its sinisterly named publication: L’Espoire Pénitentiaire. It defends the guards’ “very legitimate self-defense reflex,” accusing the authorities of endangering the prison personnel but also declining any responsibilities if the prison security, and its attendant devices, are not improved, since the riot is proof that “decided men can make themselves the masters of the detention in a few instants” (92). The pamphlet continues with a declaration from the Fleury-Mérogis branch of the GIP, and then moves to the body of the text, an “inquiry into the model-prison” which could be seen to stand behind Foucault’s own systematic suspicions about “softer” powers and punishments. Its approach differs markedly from that of the inaugural questionnaire, alternating between narrative descriptions of the prisons structures and practices, on the one hand, and thematically organized excerpts from prisoner’s accounts, on the other, with headings such as “the cell,” “the loudspeaker” and attention to “model” technologies, like the command keyboard that allows one to contact any prisoner in their cells “without needing to move a guard or without it being possible for the inmate to refuse communication” (103). Fleury-Mérogis, also makes a spectacle of its reformism, making all of its practices “symbolic” (117-18). But the humiliation is as intense as in the older prisons, albeit differently meted out. The inquiry also introduces the theme of racism (113) – which is present (if often not thematized) throughout, and is hinted at by Foucault himself in interviews, where he sees the struggles of Algerian prisoners in the early 1960s as an unrecognized precursor to the GIP. 15 Intolérable 2 is complete by an account of the revolt on 5 May 1971, two texts from prisoners, an excerpt of a France-soir article celebrating the humanism of “a different prison,” extracts from the prisons maniacally meticulous internal regulations and – a key contrast to the work of the GIP – the questionnaire of the “educators” in the prison. Intolérable 3 internationalizes the scope of the GIP, to present a dossier on the assassination of Black Panther prison militant George Jackson and the conditions of American prisons (this will also be the object of Michel Foucault’s later interview about his visit to Attica). Responding to the far more explicitly political character – the “revolutionary function” (154) – of the US prison movement, the tone of the pamphlet changes considerably (though there is little discussion of Jackson’s sui generis defense of Marxist-Leninist tenets, like democratic centralism or the vanguard party, that the GP would soon abandon). The booklet begins with a trenchantly lyrical preface by Jean Genet, with ample quotes from Jackson’s Soledad Brother, Blood in my Eye and other texts. This gives a sense of the tone: “I think we should not refuse revolutionaries, when it becomes necessary to them, that sort of magnificence of the dream and the act, especially when the latter must become exemplary; that is, when it serves to show, dazzlingly, the sense of a life that has wanted to be a complete work against a false fatality” (162). This is followed by two 1971 interviews with Jackson, where he stresses the military side of his vision, but also makes allusion to the Maoist need to inquire into order to “try to painstakingly determine what each one can do for the construction of the commune” (170), to “reconstruct the world of the people” (177). 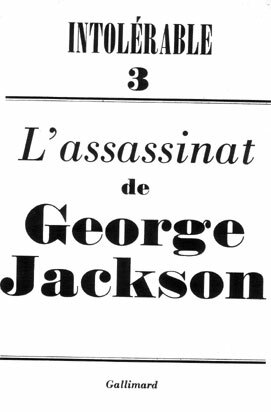 The GIP follows this with a text on the “war” in the prisons (the language is understandably more intense than in the French inquiries), “The Masked Assassination,” 16 which provides a summary of the events leading up to Jackson’s death, and of the campaign of disinformation and counter-offensive. The objective of the latter is five-fold: undermining the prisoners’ lawyers; “bringing under suspicion of complicity the whole black community”; “making the devalued image of the guards reassuring”; “breaking the common front between black and white inmates”; and destroying the prestige of black leaders who are unifying ordinary and political prisoners (194-5). A further text analyses the aftermath and underlines (perhaps under Deleuze’s pen) Jackson’s “line of flight” as proof that power is not a seamless moloch, that “everything escapes power, beginning with what it does, what it conspires about but does not dominate. The murder of Jackson is one of these things, a line of flight, as Jackson would have said, to which revolutionaries commit themselves” (209). 17 The final text in Intolérable 3, “Jackson’s Place in the Prison Movement’, echoing some of Foucault’s own reflections on the marginal plebs (let’s not forget that “the Lumpen” was a key political category for the Black Panther Party), advances Jackson’s idea of prisons as a fulcrum for the creation of revolutionaries as a positive challenge to the incorporation of bourgeois ideologies about crime into the labour movement. Hors serie, the call from the US is echoed, albeit in a very different key – that of everyday, often seemingly minor, demands without any explicit revolutionary horizon – in the Cahiers of demands issued by prisoners involved in the then recent rebellions at Toul, Loos-Lès-Lille, Nancy, Fresnes and Nîmes. Against the grain of a reading of these texts as archives of singularities (suggested in Artières’s postface) the Cahiers begin with a declaration that these testimonies designate “a vast, complex and diverse system, which, in the name of ‘security’ … seeks to humiliate and break each prisoner” (223). Though the text returns to a language of prise de conscience which the GIP manifesto had sidelined, it also stresses that what is at stake is a “collective and continuous movement,” in which the proletariat of the prisons has relayed the one of industry and services: “The inmates have occupied the prisons like workers occupy the factory” (224). 1. ↑ Richard Wolin, The Wind from the East: French Intellectuals, the Cultural Revolution, and the Legacy of the 1960s (Princeton: Princeton University Press, 2010), 4, 342. 2. ↑ Julian Bourg, From Revolution to Ethics: May 1968 and Contemporary French Thought (Montréal: McGill-Queen’s University Press, 2007), 343. See also Serge Audier, La pensée anti-68 (Paris: La Découverte, 2008), 354. I discuss these texts and the objections – by the likes of François Cusset and Kristin Ross – to the thesis of ‘68 as a vanishing mediator for liberal democracy in “Beginnings and Ends: For, Against and Beyond ‘68’,” New Formations 65 (2008): 94-104. 3. ↑ One should also note the participation of Gilles Deleuze, who took on much of the work for Intolérable 4, of Pierre Vidal-Naquet (historian of ancient Greece) and Jean-Pierre Domenach (left-Catholic editor of the journal Esprit), who co-signed the founding manifesto of the GIP with Foucault, of Danielle Rancière and of Foucault’s partner Daniel Defert. Among those who participated in the GIP’s actions and campaigns were also Jean-Paul Sartre, Helène Cixous, Jean-Pierre Faye and Jacques Donzelot. On Deleuze’s participation in the GIP, including the risks to his health incurred in their demonstrations, and how they fed into his redefinition, with Foucault, of the role of the intellectual, see François Dosse, Gilles Deleuze & Félix Guattari: Intersecting Lives, trans. Deborah Glassman (New York: Columbia University Press, 2010), 309-13. 4. ↑ Groupe d’information sur les prisons, Intolérable, ed. Philippe Artières (Paris: Verticales, 2013). Page numbers in parentheses are from this text. 5. ↑ The original questionnaire had been drafted by Christine Martineau, a lawyer then finishing a book on prisons, and Danielle Rancière, with Marx’s 1880 inquiry as the model. Dosse, op. cit., 310. The GIP also gave rise to a host of other information-groups, on health, youth services, and so on. 6. ↑ Michel Foucault, “Table ronde” (1972), Dits et écrits I, 1954-1975 (Paris: Gallimard, 2001), 1202. Foucault also speaks of the “the violent marginal strata of the plebeian population’ recovering political consciousness.” “Le grand enfermement,” Dits et écrits I,1171. See also his declaration, in a discussion with a Renault Billancourt worker, that “If you look carefully at the working class, in the final analysis, it is illegalist.” “L’intellectuel sert à rassembler les idées mais son savoir est partiel par rapport au savoir ouvrier” (1973), Dits et écrits I, 1290. 7. ↑ “À propos de la prison d’Attica” (1974), Dits et écrits I, 1400. 8. ↑ “Le discours de Toul” (1971), Dits et écrits I, 1106. 9. ↑ “Un problème m’intéresse depuis longtemps, c’est celui du système pénal” (1971), 1075. 11. ↑ This Verticales edition also contains a very useful, detailed chronology of the actions of the GIP and relevant circumstances. 12. ↑ “Préface” (1973), Dits et écrits I, 1266-7. In an uncharacteristic turn of phrase he calls this: “A philosophy of the people” (1267). 13. ↑ “Préface” (1973), Dits et écrits I, 1263. 14. ↑ Foucault makes an explicit link between the everydayness of prison demands and the everyday as a site of politicization post-68 in a 1973 interview: “Prisons et révoltes dans les prisons,” 1296. See also Dosse, 312. 15. ↑ “Prisons et révoltes dans les prisons” (1973), Dits et écrits I, 1294. 16. ↑ Already translated into English as Michel Foucault, Catharine von Bülow and Daniel Defert, “The Masked Assassination” in Joy James (ed. ), Warfare in the American Homeland: Policing and Prison in a Penal Democracy (Durham: Duke University Press, 2007). Also edited by James is the excellent collection, containing Jackson’s “Toward the United Front,” Imprisoned Intellectuals: America’s Political Prisoners Write on Life, Liberation and Rebellion (Lanham: Rowan & Littlefield, 2003). 17. ↑ Deleuze and Guattari cite Jackson’s declaration “I may be running, but I’m looking for a gun as I go” in the discussion of the “line of flight” in A Thousand Plateaus, trans. B. Massumi (London: Continuüm, 2004), 226. See also Michelle Koerner, “Line of Escape: Gilles Deleuze’s Encounter with George Jackson,” Genre 44.2 (2011), 157-80. 18. ↑ The final Intolérable also contains a brief commentary on H.M.‘s letters as a “lived analysis of the personified mechanisms which do not cease to push [young people] into houses of correction, the hospital, the barracks, prison” (312); five further documents on suicide in prisons; an interview with a prison doctor, detailing the parlous state of carceral psychiatry; and an example of an official complaint by the Association for the Defense of the Rights of Inmates.